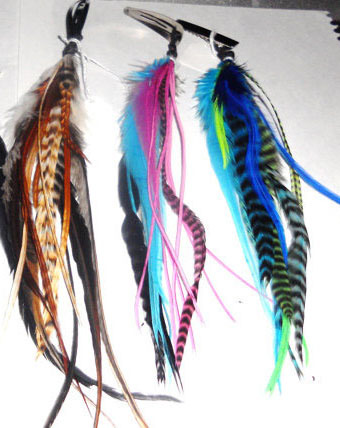 Feathers Clip In Hair Extensions are bright colored, fun, and easy to use. Each extension has three feathers bundled together ranging between 3 to 4 inches in length. They are attched to a mini black clip which is used for human hair extensions. Feathers Clip In Hair Extensions are packaged in quantities of 3 assorted colors.